When my husband was a boy, he used to hide plastic dinosaurs in the cuffs of his trousers before heading off to school. He no longer carries around toy triceratops, but they do inhabit our shelves and windowsills. He also collects books about prehistoric life, and in one of these I found a picture of a woman wearing a long skirt and straw bonnet, holding a tool meant for chopping. I had to find out who that woman was. I traveled to Lyme Regis, the town on the coast of England where Mary was born in 1799 and where she spent most of her life. I walked along the beach where eleven-year-old Mary found a seventeen-foot-long ichthyosaur fossil. I looked at pictures in the town’s historical museum, bought souvenirs in a fossil shop, and found the gravestone Mary shared with her brothers by the church where a stained glass window is dedicated to her: a large ammonite fossil is propped on the sill. I listened to the waves and imagined the questions Mary might have posed as she chiseled the rock, slowly, painstakingly, back at a time when the word “dinosaur” hadn’t yet been coined. I returned home, where pictures of Mary Anning soon found a place among the plastic prehistoric creatures, books, and geraniums. I sent pictures I’d taken and books I’d bought to Michael Dooling, who used oil paints to capture Mary’s wonder and determination and the feeling of a foggy nineteenth-century seaside town. In classrooms, sometimes we make a list of qualities of Mary Anning and scientists in general. Then we talk about the things Mary did that let us know she was persistent, curious, observant, loved her work, etc. The one drawing that was made of Mary before she died showed her wearing a shawl and top hat. It’s assumed she wore the gentleman’s hat to protect her head from rocks that might fall from the cliffs where she worked. Someone may be able to bring in a top hat, which people originally wore the way kids now wear bicycle helmets, to keep their heads safe. What did Mary think about wearing the hat at the beginning of the book? How did she feel at the end? What changed? It’s fun to study how fossils form, and some enterprising students (with even more enterprising teachers) have made their own fossil-like plaster casts. Kids can research some of the extinct creatures Mary discovered; they can compare pictures of the fossils of the ichthyosaur, pterosaur, and plesiosaur to the drawings made by artist-scientists. Michael Dooling: History Through Picture Books. 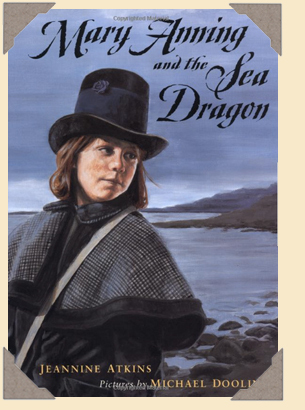 Here you can learn more about the illustrator of this book and dozens of others, including Anne Hutchinson’s Way. Michael tells a bit about how he does research to get the details just right and finds costumes: he says that every day is like Halloween at his house! To purchase, please click on this link to Amazon.com.